On April 16, Benjamin Underwood as the assistant coordinator of the Thursday University Center weekly events at St. Mary’s University, created an event for students, originally a pub night, Oyster Bake Skip Day. Because classes where cancelled that day, Underwood had the opportunity to expand the event providing free food, live music, a photo booth and games. Underwood mentions that these events have been successful because they’ve brought over 100 students since they first started three semesters ago. 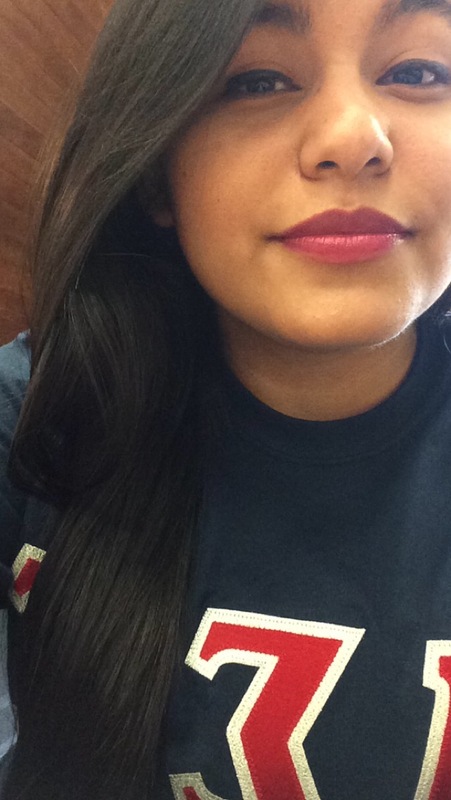 After Spring break, Coatlicue Molina, senior political science major, decides to go back to the gym. She mentioned that it had been weeks since she worked out. In her workout, Molina started with the treadmill for about 20 minutes, then three sets of weights, five sets of donkey kicks in the cable machine, three sets of leg presses and ending with four sets of deadlifts. She mentions that working out and eating healthy is vital to her lifestyle in order to maintain her grades, work and personal relationships. A Slice of Life: Faces and places that make up St. Mary’s University. 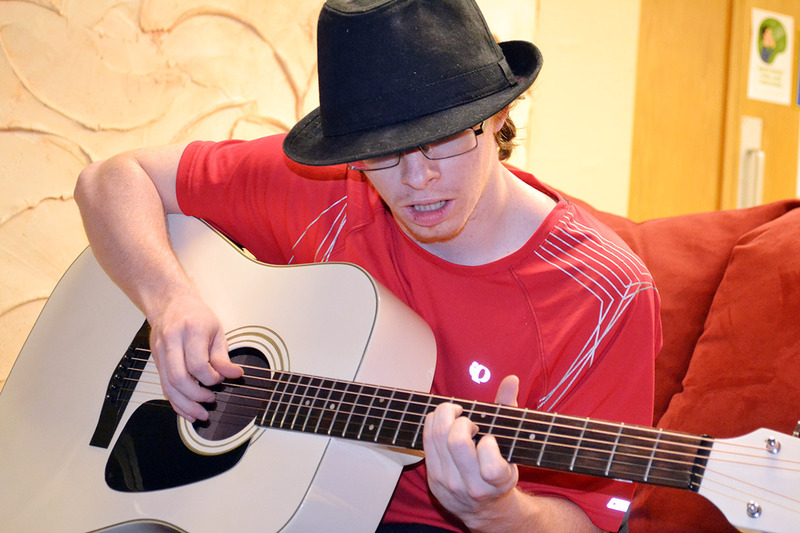 Alexander Eakins, senior English major practices the guitar as a hobby when he started taking classes at St. Mary’s University. As he improves, he hopes to write his own lyrics and produce his own music. With my first project using sound , I learned how to convert a file from aif to mp3. Actually, that was quite necessary in order to start a project. One of the things using that I was aware of is that I have bad management when organizing files. I made three folders using the same sound and I had to learn where to best conveniently place them. As I was doing this project, I would spend more time editing the sound that that it is more clear and natural. I think I did a fairly decent job, but I didn’t do it as clean as I could have. I need to be more detailed so that the interview sounds genuine. The most challenging part was to edit the gaps of silence because if I edited too much, it wouldn’t seem natural. It was also a bit difficult to copy each file again and rename it, but at the same time it was good management skills to practice. This project took me about three hours. I interview the person, but had to interview them twice because my recorder does not record at the best quality. Then from them I put all in the information in final cut pro and started editing everything. Daniela Lopez, a speech communication senior at St. Mary’s University said after graduation she had two possible plans-look for a job in her field, or go back home lose weight in order to enlist in the Marines. Her reasoning enlisting is to change her lifestyle of becoming physically and mentally fit to inspire her family, herself but in the future, her children. I don’t know how to feel as I begin my last semester. It is becoming more and more real that I will graduate and that I need to get a job after graduation. It worries me that I don’t have enough experience in my file that a job requires, but relax because I know my professors have given me several projects that are worthy of showing to potential employers. I’m very excited to become more familiar with managing a website and to create two video projects for this class I’ve become more interested in video. One of the most challenging’s things I face is time management. I have a lot on my plate this semester. I was currently promoted to Design editor for The Rattler, an internship, work-study and 15 hours of classes, not to forget the homework. The reason why I have so much is because I want to get as many experience as I can before I graduate. As long as I give myself time to finish all of my work, I will be fine. I have my planner ready. Another challenge is to acquire the materials I need for this class, but as soon as I get paid I will get them. Tis course will be useful to me because eit will help me manage a website and create several projects that I can use in my portfolio. I’m genuinely grateful for all the help I’ve received in throughout my career at St. Mary’s University and for all of the challenges professors have given me to better develop myself. Thank you. Students in Media Production II. 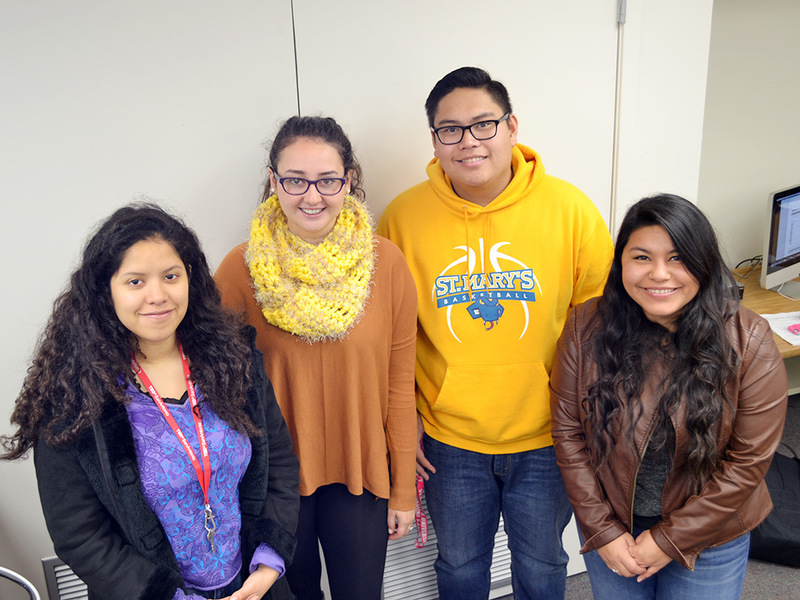 From left to right: Alondra Garcia, Clarissa Yanar, Brian Magloyoan, Daniela Lopez. My name is Alondra Garcia. I am a senior, English Communications major studying in St. Mary's university.